Spring is definitely upon us with day-to-day changes in weather. 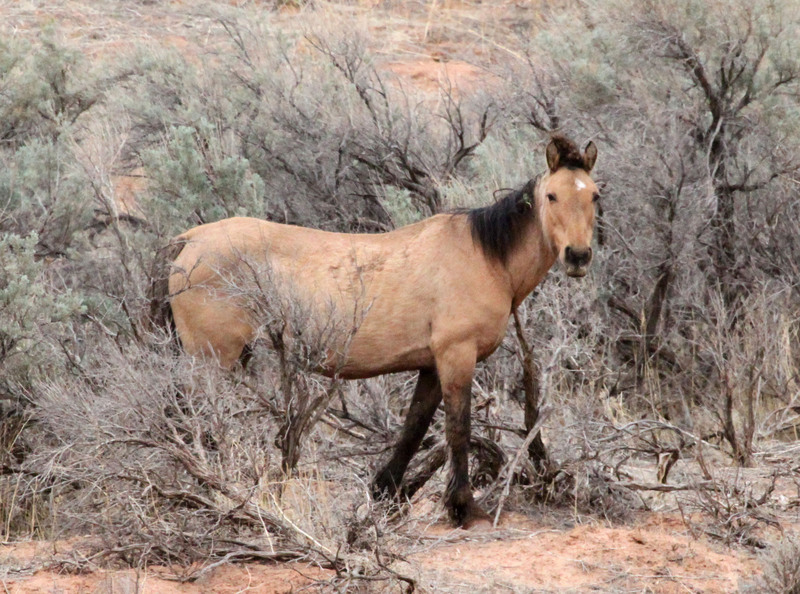 For the past month or so, the wild horses in the Dryhead have been solitary stallions. 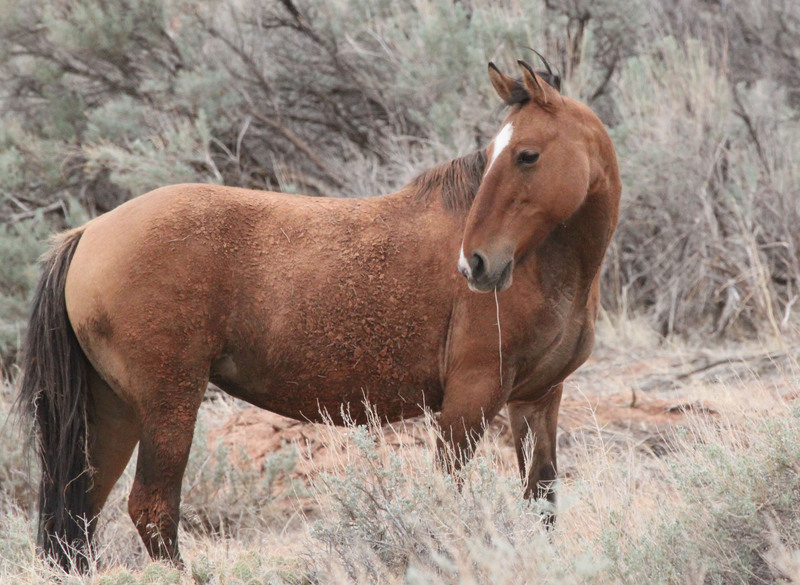 Because of their social nature, it isn’t typical for wild horses to be alone except for stallions, both young and old. 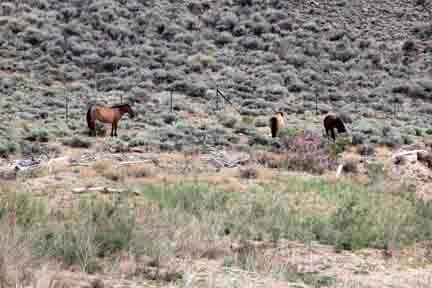 Kemmerer, Fiero, Merlin, and Seattle have been spotted grazing on the spring grass of Mustang Flats. Other than the Greeters at Crooked Creek Bay, sightings of bands just wasn’t happening. 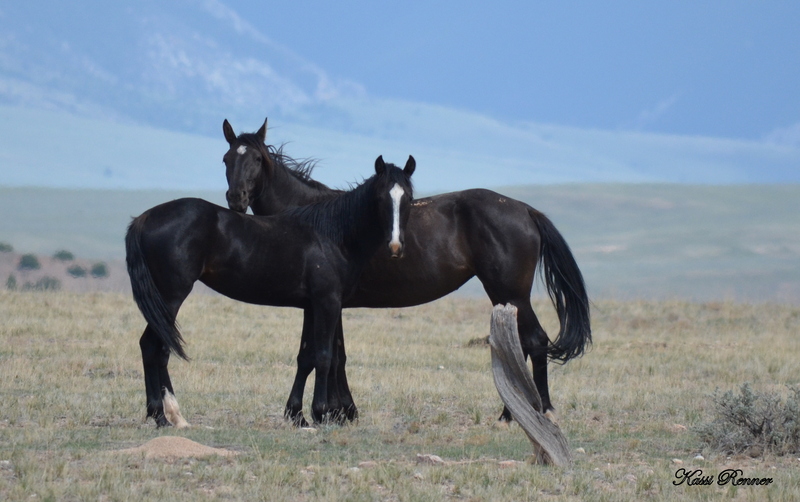 On June 12, Hickok, Seneca, and Hightail were grazing on the south side of Crooked Creek Bay. Jesse James has not been with the group for a few days. Things began to change on Tuesday. 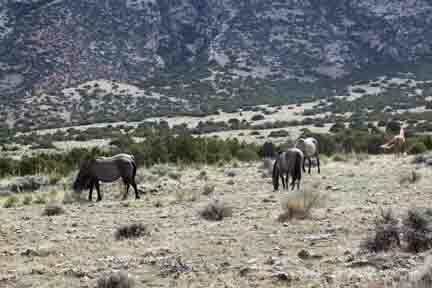 At the Center we had received word from visitors of a large band on Mustang Flats. This was an exciting change after so many days without seeing band of horses past Crooked Creek Bay. In addition, to changes on the Dryhead, the Mustang Center has made some changes as well. John Nickle has taken on the post as director. He and his wife, Lynda, have taken the reins to operate the Center along with two high school interns, Sydney and Kassi. Former director, Lori Graham, and last year’s high school intern, Brianna, volunteer their time and expertise to get things up and running. That afternoon I took Kassi up to the Dryhead to acquaint her with the horses and the land so she could accurately provide information to visitors based on firsthand knowledge. Kassi will be a senior at Lovell High School. Photography is one of her many interests and talents. 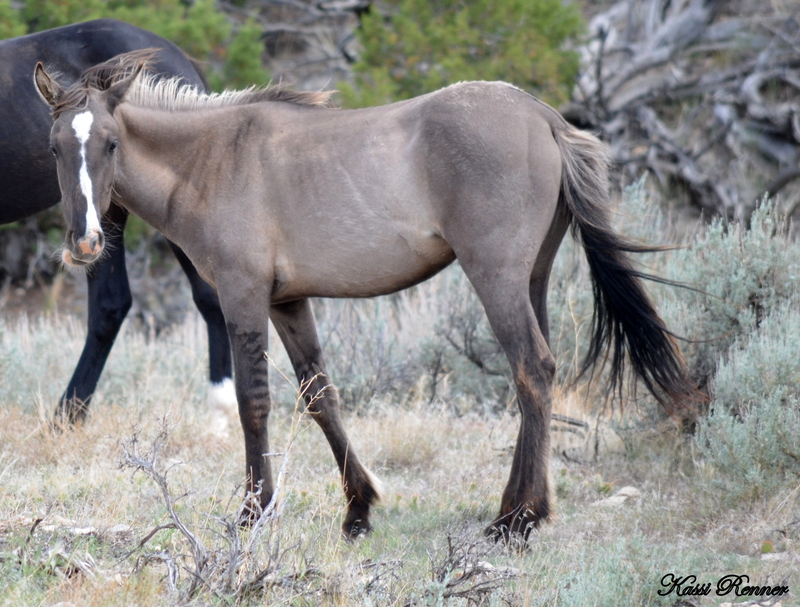 Her photos capture the band we spotted on Mustang Flats on June 12. 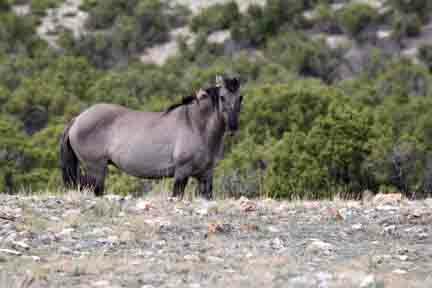 It is Hidalgo and his large band of mares and their offspring. Shawn Ivie recently reported news of Hidalgo’s band on his Wyoman Photography blog. It was exciting to meet Hidalgo’s new family that consists of his big sister Fresia (and colt Montana) and Corona & Waif’s three daughters Halo of the Sun, Icara (and her filly Morgana), and Jewel (and her filly Mercuria). 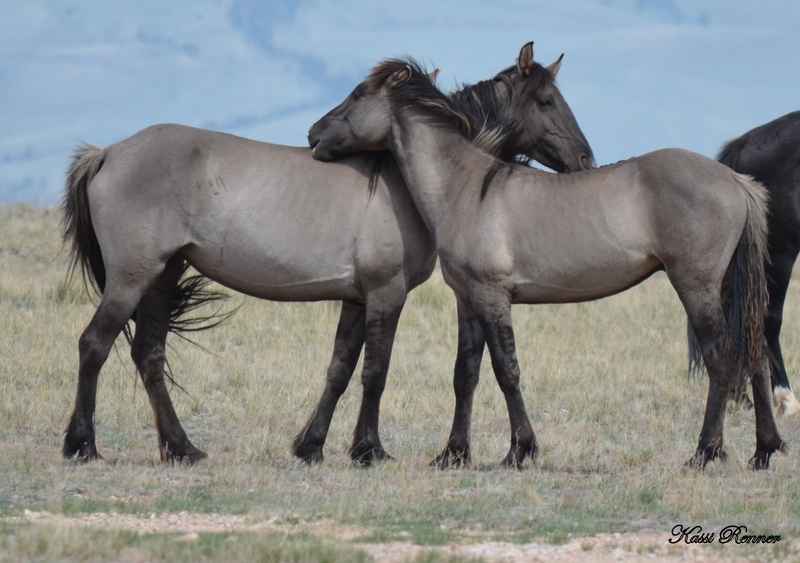 Kassi’s pictures show the band as they quietly grazed and groomed. 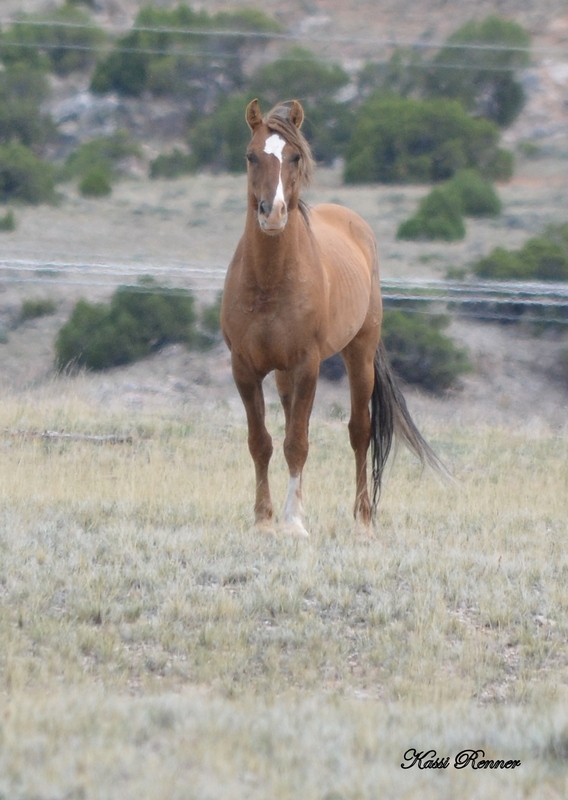 Hidaldo, 2007 son of Durango and Buffalo Girl now heads up a band with seven mares and their offspring. In the heat of the day, with swirling bugs, Hidalgo’s band finds comfort together. The following day brought even more news of Dryhead changes. This was reported once again by visitors to the Center. The mention of Blizzard’s name sent me heading back to the Range. Sure enough as I scanned Mustang Flats with my binoculars Blizzard’s unmistakable golden coat was shining in the afternoon sun. 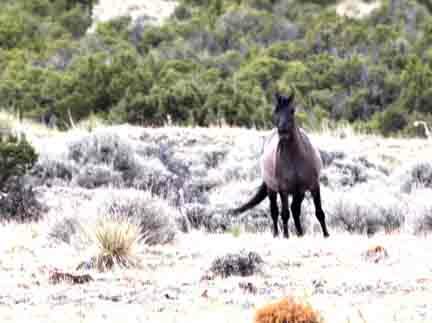 A quick look-around showed four grulla horses with him. A short westward hike brought me into a good viewing range. Bakken was the sentinel who took the first look at the intruder. Bakken watches me as I approach the band. I circle around the group, my eye on Blizzard. At the age of 12, he has acquired a band of impressive mares. Blizzard against the backdrop of Big Horn Canyon. Cascade has a breathtaking elegance! Through the years I have seen her at this same spot with this same alert pose. 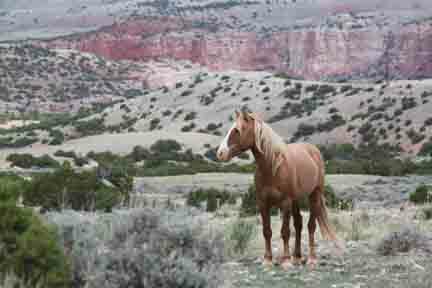 Sacajawea, a wise mare that maintains a shy “wildness” to her. 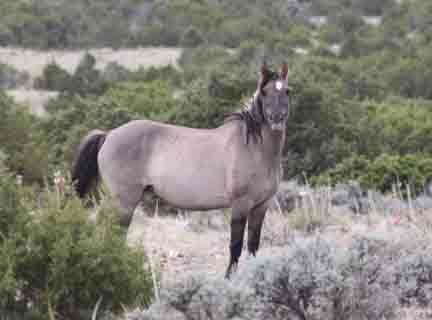 Strawberry is a grulla roan with a large star and small snip. The presence of the two bands on Mustang Flats is an exciting change. 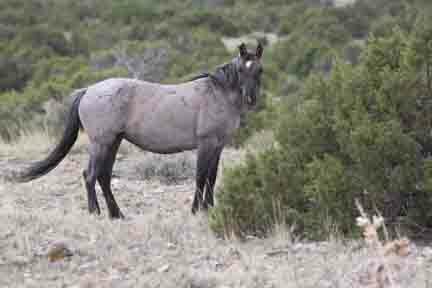 Hidalgo, at the young age of six has acquired a large band of young mares. 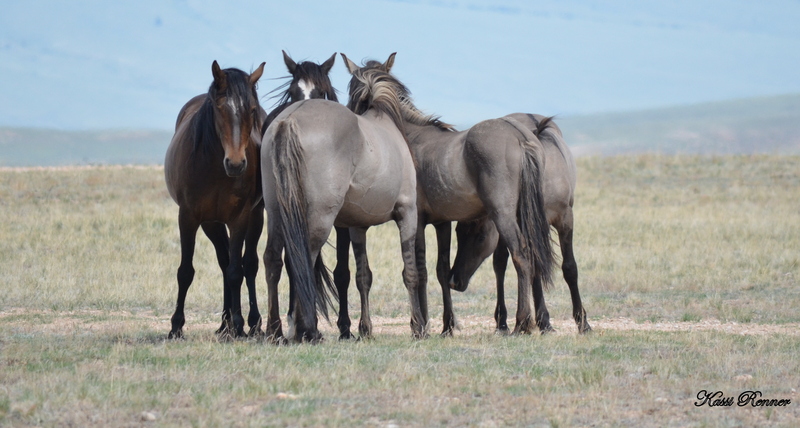 Blizzard’s band is more established with the “grulla bunch.” The kinship of the mares is a fascinating subject for me and an observation I’ve made is that the dynamics of the harem bands isn’t always dependent solely on the stallion. Certain mares seem to have bond that keeps them together despite the stallion. Broken Bow and Demure on Burnt Timber are the strongest example of this relationship. However, Bakken and Cascade have been together for years as part of Seattle’s band. The Corona/Waif daughters seem to find their way back to each other as well. Keep in mind, this is just my observation with no real science to back it. Changes are just a natural part of life. The changes on the Dryhead and the changes at the Mustang Center are exciting! Only time will tell if Hidalgo and Blizzard’s bands will endure or if other bands will wander down onto the Dryhead in the next few days or weeks. We will definitely keep you informed throughout the summer.